One of the perks of blogging is the invitations for the behind the scenes tours of places you’d never be allowed in otherwise, to fully indulge the Food Geek in all of us in the how it’s made process that thrills and fascinates those of that have dedicated our loves to internet food. The vast majority of these invites I turn down. The ones I accept are only from companies I can get behind. Harry & David is a fantastic Pacific Northwest company. Although I choose to highlight their pears and Moose Munch, they’re so much more. They even have a well stocked bottle shop section of their Harry & Davids company store in Medford Oregon, I picked up a bottle of Alameda My Bloody Valentine and Walkabout Jabberwocky Ale. I was also amazed that this company that does such large volumes or candy, fruit, wine and gifts was run by a small and dedicated team. They all seemed to know each other, support each other and value the quality of their products. It’s exactly the type of company I want to support. Plus there is talk of beer cheese dip and beer bread mixes making their way into the Harry and David baskets, something I’m definitely keeping an eye out for. Until then, I’ve poached some pears in beer and smothered them with beer chocolate sauce and topped it with some of that famous Moose Munch for a little texture. In a large pot over medium high heat add the beer, 1 cup sugar, vanilla, cloves. Bring to a simmer. Add the pears and enough hot water so that pears float. Cook until the pears are fork tender, 15-20 minutes. In a separate pot add the chocolate stout, corn syrup, remaining 1/3 cup sugar and cocoa powder, bring to a simmer. Cook, stirring occasionally, until thickened, about 8 minutes. Drain the pears and add to small bowls. Drizzle with chocolate sauce, sprinkle with chopped Moose Munch. *For the poaching liquid you want a malty beer, but not a dark beer (dark beers may change the color of the pears). Look for a Belgian ale, brown ale or amber ale. *You can also use regular caramel corn in place of Moose Munch. Harry & David paid all the expenses for the trip , but this post was not sponsored or expected. I’ve noticed something about you. You seem to have no interest in healthy beer recipes. 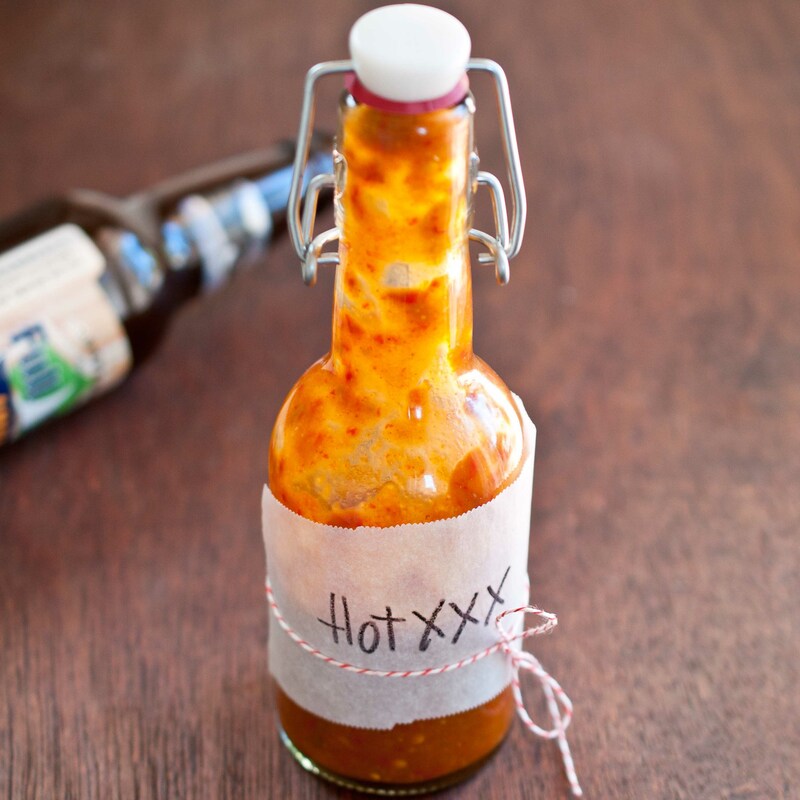 You want your beer recipes to be a flagrant indulgence of full-flavored stimulation. You want chocolate and bacon and sugar and whatever else I can manage to squeeze into your meal. No “semi-homemade” or “skinny” versions will do for your beer baking, you want it to be bold and extravagant, diet repercussions be damned. You also have no problem with my recipes that take hours, making Bacon Beer Jam with delighted voracity. 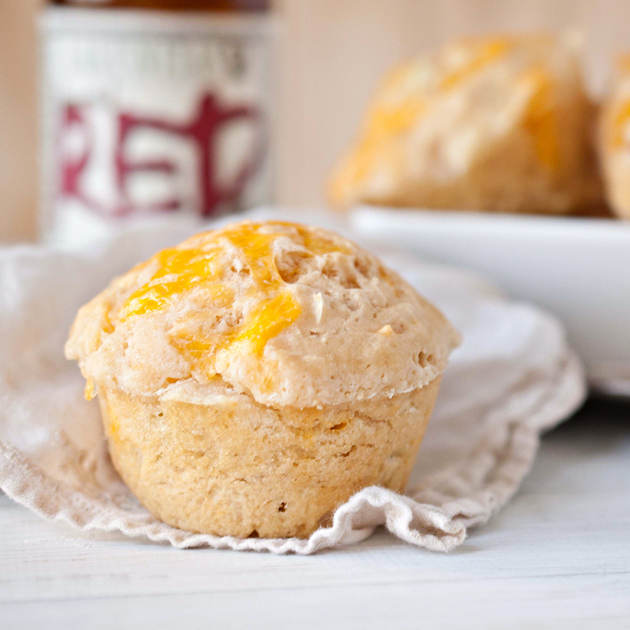 So it is by pure accident that I offer to you a recipe that only takes 5 minutes to throw together and less than 20 to bake, allowing you to get a fully flavored beer muffin on your table in less than a half an hour. Although I know you would have been more than willing to spend much longer. I appreciate your tenacity. 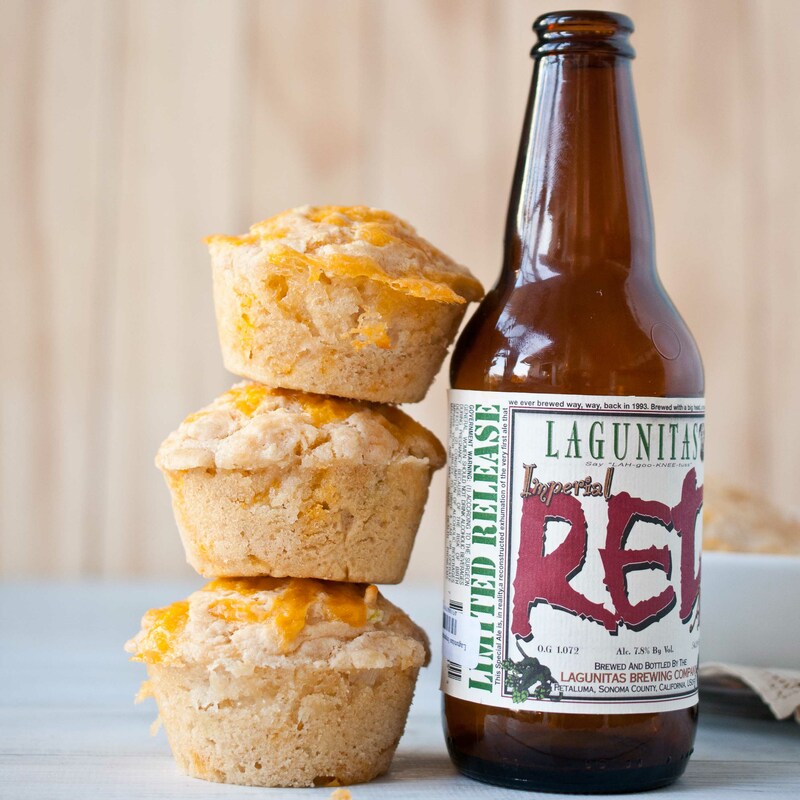 For these Beer Bread Muffins, I used Lagunitas Red, a special release that’s just so fun to drink. Preheat oven to 350. Spray muffin tins with cooking spray. In a bowl combine the flour, sugar, baking powder, salt, cheese and onions, stir until well combined. Pour in 1/4 a cup of melted butter plus the 6 oz of beer, stir until just combined. Pour batter into muffin tins until each well is about 1/2 full. Pour remaining 2 tbs of butter onto the tops of the muffins, dividing evenly between each muffin. Top with additional cheese, if desired. Bake at 350 for 18-20 minutes or until the muffins have puffed and a toothpick in the center comes out clean. Serve immediately, these are best right out of the oven. 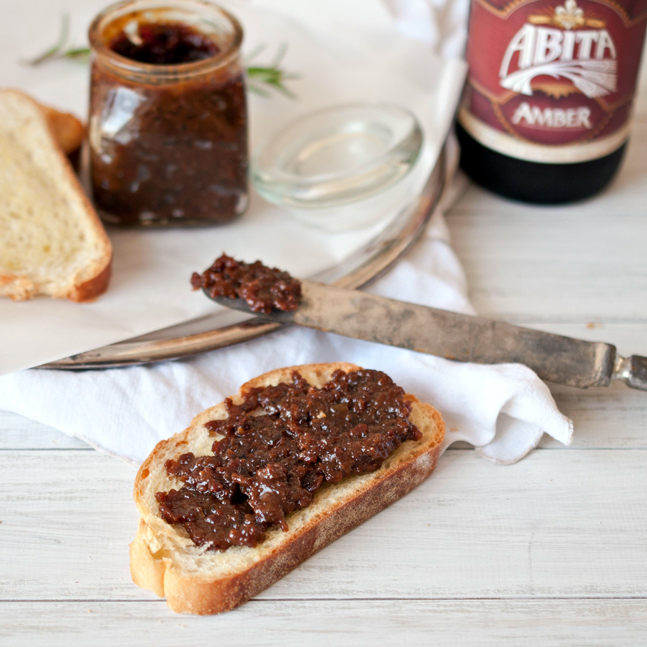 Beer and bacon in a spreadable form, this may be the best thing to ever come out of my kitchen. It is a simple food, a few ingredients that over time become large with flavor and possibilities. A conversation piece, something your guest won’t forget, or a handmade gift for those carnivorous beer lovers in your life. Although the cooking time is long, your active time is relatively short. This is the perfect way to spend a lazy sunday afternoon: The smell of bacon welling up around you in a sun soaked kitchen with Delta Spirit rising from the speakers and the rest of the demanding world no longer existing. Just you, music and the transformation of ingredients happening on your stove. Cooking, creating, lingering in my kitchen gives a very grounded feeling to my over extend life. A reminder that I need to slow down and enjoy, just be. A recipe that ask little of me other that the time it takes to simply simmer is a reminder of that, just be. In a large pot or dutch oven, cook the bacon, working in batches if neccessary. Remove the bacon from the pan and allow to cool and then roughly chop. Drain off the bacon grease from the pot, leaving only about 1 tbs bacon drippings in the bottom of the pot. Return the pot to heat and cook the onions until soft and translucent, about 3 minutes. Add the garlic and stir for about 30 seconds. Add 1 cup beer and both vinegars, scraping to deglaze the bottom of the pot. Add the brown sugar and the bacon, reduce heat to maintain a simmer. Place the lid on the pot at an angle, allowing to vent the steam. Cook until reduced to a thick and syrupy consistency, stirring occasionally, about 45 minutes. Transfer to a food processor along with remaining 1/4 cup beer and pulse until most of the large pieces have been chopped. 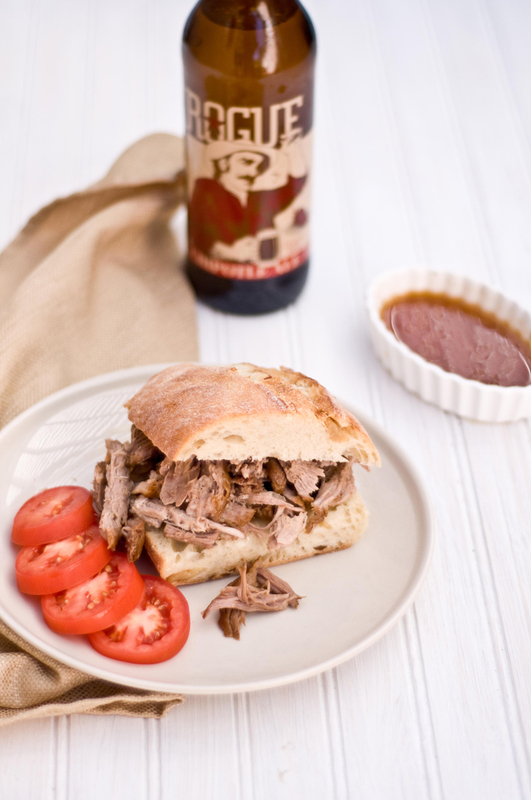 There’s a good chance that when you think about cooking with beer, a meat recipe comes to mind. Your Dad’s beer marinated ribs? Beer can chicken? 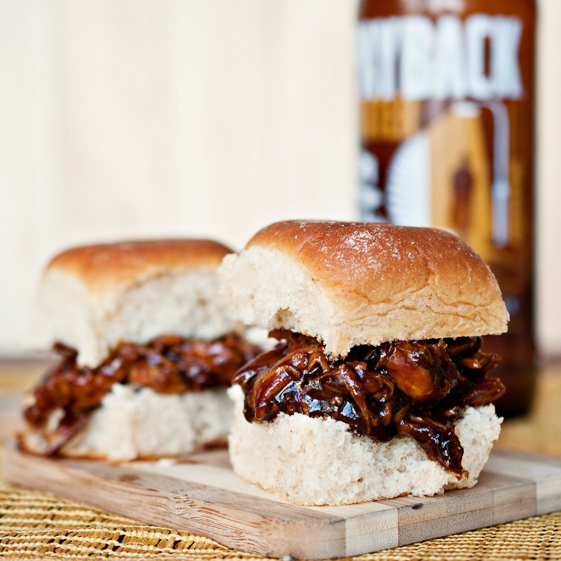 Beer braised pork? There’s a good reason for that. Not just for the spectacular flavors that craft beer can impart on the meat, but because beer, especially high acid beer, acts as a meat tenderizer by breaking down tissue. For this recipe you are free to run the spectrum of beer styles. Most recipes I write will be accompanied by stern warning about using any beer other than the type called for, this isn’t one of those recipes. That IPA I keep shaming you into avoiding? You can even give that a try. My gut instinct with a recipe like this was to use a light, high acid beer with herb notes (basil, sage, oregano) but I opted for a porter to test my “Any Beer Goes” theory. The porter effect, as I am now calling it, gave a “meatier” quality to the chicken. Which turned out wonderfully, and gave this a bit of a pork taste. 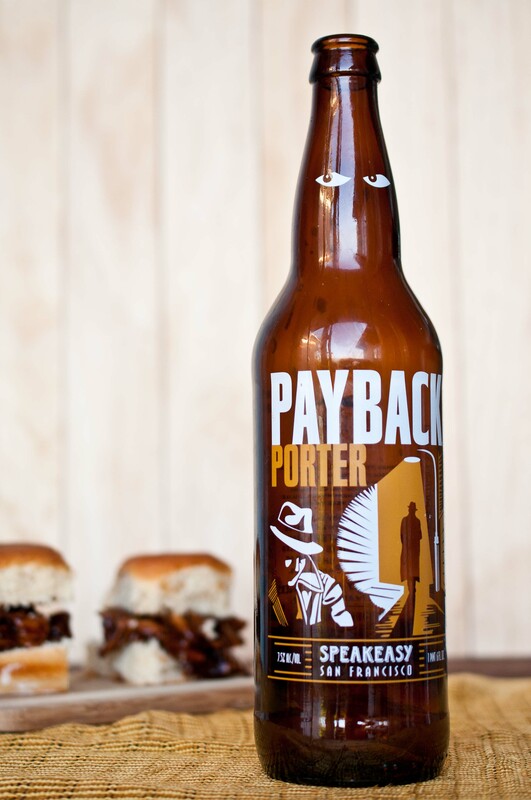 The beer I used for this recipe was the Payback Porter by Speakeasy. It’s a fantastic choice for a porter because the notes are similar to those I see in barbecue sauces and rubs: smoke, coffee, cocoa, and molasses. Next time I’ll use a beer with a high acid content for a little contrast, but as far as the beer that you pick, experiment and let me know how it goes. Heat 2 tbs canola oil in large pot or Dutch oven. Sprinkle the chicken with salt on all sides. Place in the pot and cook on each side until browned, about 2 minutes per side. Cover with 1 1/2 cups of beer and 1/2 cup chicken broth, cover and cook for 15 – 20 minutes or until chicken is completely cooked. 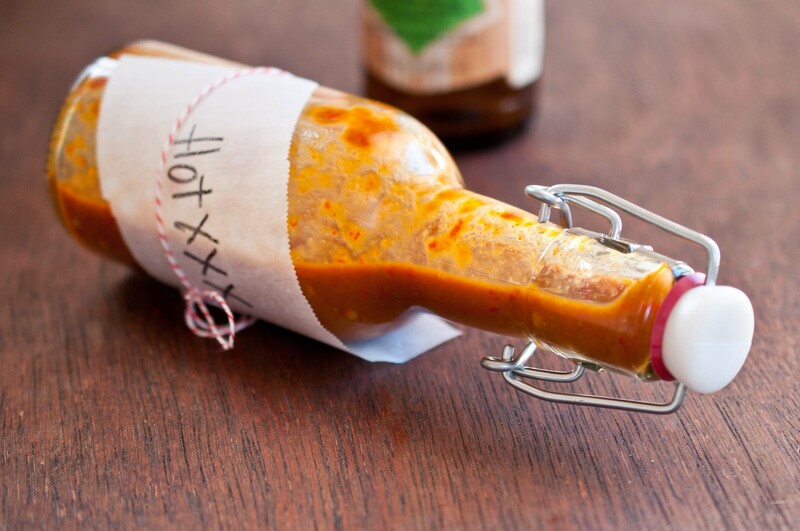 While chicken is cooking, prepare barbeque sauce by warming olive oil in large saucepan over medium-high heat. Add garlic and sauté for 30 seconds; add 1 cup beer, hoisin sauce, chili powder and soy sauce. Cook for 10-15 minutes or until thickened and reduced, remove from heat. When chicken is cooked, remove from pot and allow to cool. Using two forks, shred chicken to as thin slices as possible, then add to hoisin barbeque sauce pan, tossing well to coat. Split rolls in half across the middle to resemble small sandwich buns, fill with chicken. The best part about visiting a brewery is the opportunity to sample those special release beers that never make it into bottles. Those brews that are only made in small batches, put into casks that sometimes make it to local pubs or events but will never make it into bottles in your local distributors shelves. Like those songs your favorite band will never record but will occasionally play live if you happen to catch a show on the right night, these are beers that make you feel special for having been granted the experience. In a world where it seems everything is accessible with the right google word search, these near mythical concoctions are only available to those who happen to be in the right place at the right time. One of my favorites is the Habanero Sculpin from Ballast point. Because of the process they use, the heat is fresh and bright. An uncooked scorch that isn’t shy. Habaneros are an extremely unpredictable ingredient, with heat levels that vary widely from pepper to pepper, making every cask of Habanero Sculpin different from the last. If you ever make it down to San Diego, stop in for a pint and count yourself among the special few. 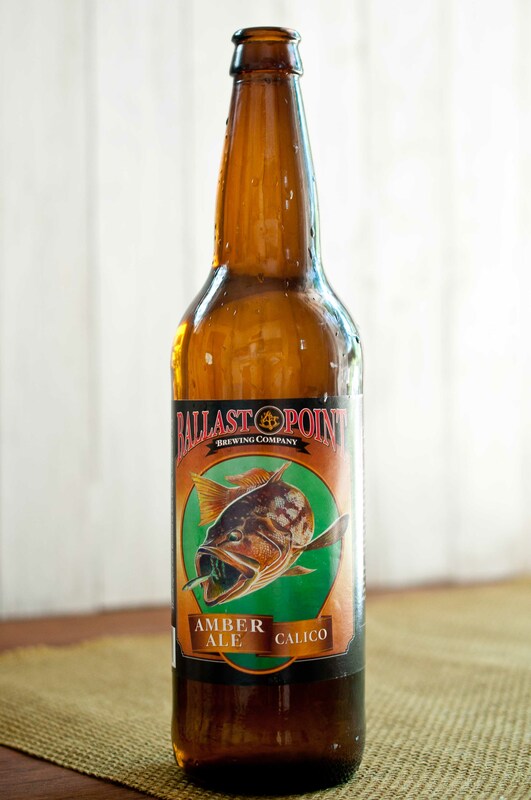 Since I wasn’t able to get my hands on any Habanero Sculpin, I found myself fixated on this Ballast Point Calico Amber Ale. And the result was a toffee that I couldn’t stop eating. So addictive, and it only takes about 20 minutes to make. I already have plans to make and hand this out as Christmas gifts, if I can wait that long to make it again. In a large pot over high heat add the sugar, butter and 1/2 cup amber ale, it will triple in volume during the cooking process so make sure to use a large pot. Stir until the mixture starts to boil. Allow to boil untouched until the mixture starts to darken and thicken at about 230 degrees. Stir continuously until it turns a very dark amber and hits 290 degrees. This process will take between 15 and 20 minutes from start to finish. 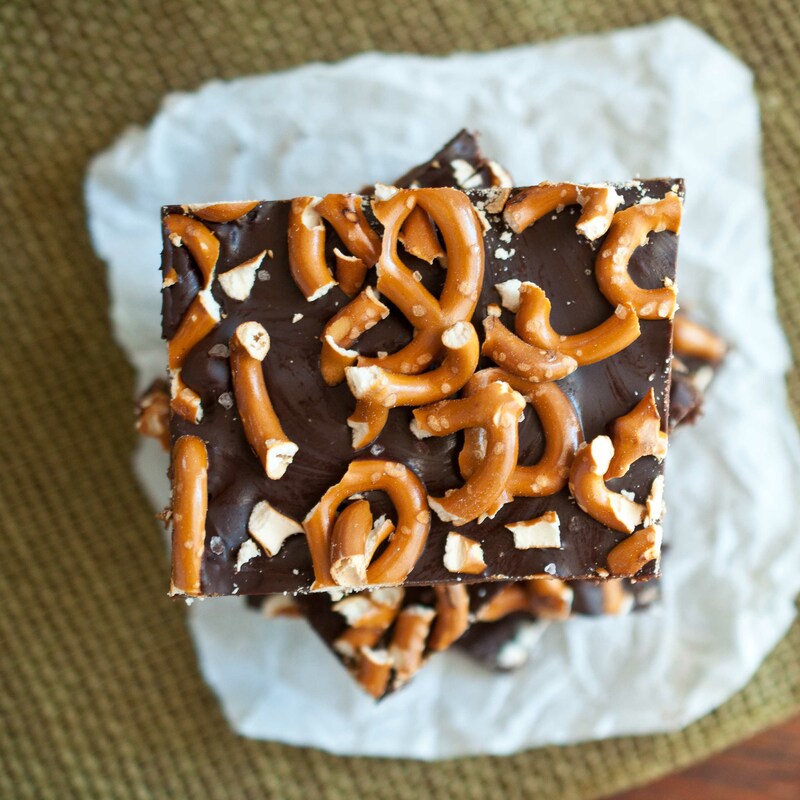 pour onto a baking sheet covered with parchment paper or a Silpat. Allow to cool. Add the chocolate to a large bowl. Heat the beer until hot but not boiling. You can heat it on a pot on the stove or microwave it in a microwave safe bowl. If you use the microwave, know that the beer will foam up once it reaches it's boiling point. Pour the hot beer over the chocolate chips and stir until well combined and melted. 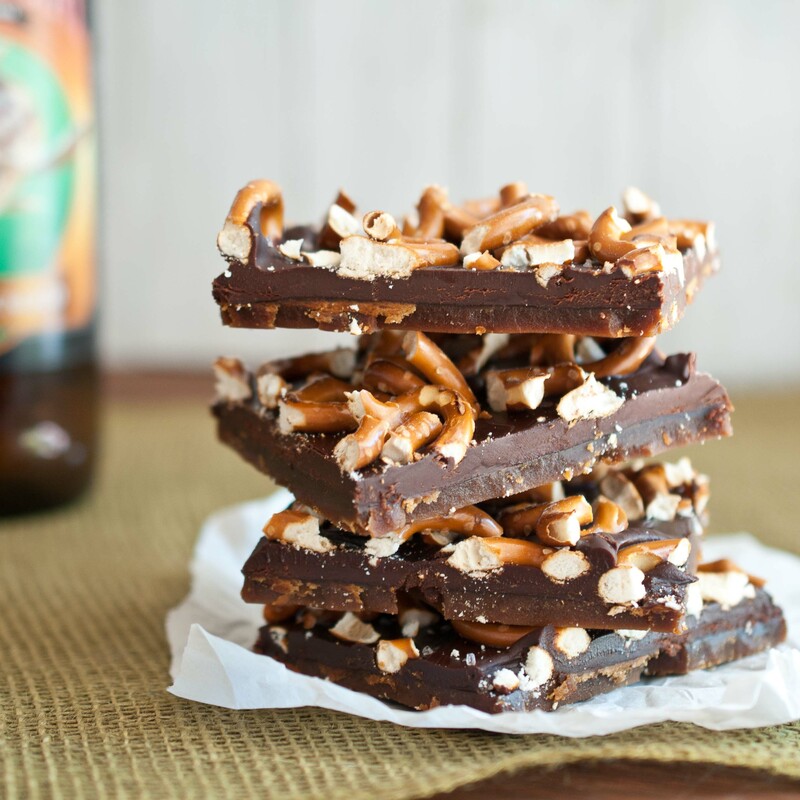 If you use a chocolate with less than 60% cocoa content, it will have higher levels of milk solids, because of this it will have a more difficult time hardening once the beer is added. Try to fine 60% and chill it to set. Why do I cook with beer? What is it about this fantastic beverage that drives me to create recipe after recipe with beer as a star ingredients? Flavor. Beautiful and complex flavors that take months, even years to perfect by brewers. Aside from that, beer is a natural meat tenderizer, making it the perfect choice for a brining liquid and explaining that Beer Can Chicken recipe you keep seeing at tailgate parties. 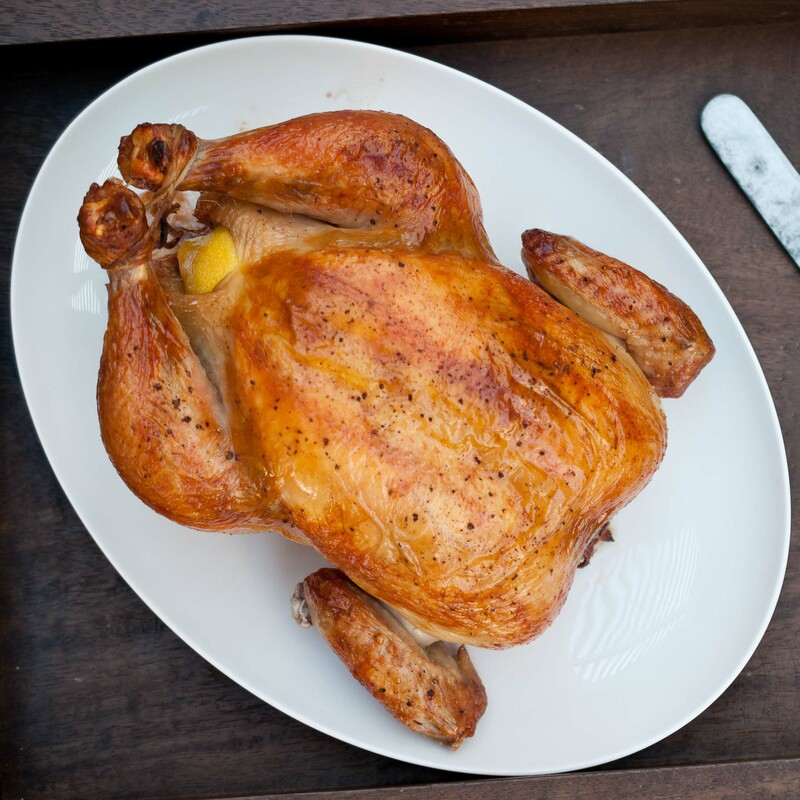 Due in no small part to the beer in the brine, it’s flavors and tendering properties, this recipe gives you a juicy bird, crispy skin and the perfect level of beer taste. That’s why I can’t stop cooking with beer, it’s just so perfect. 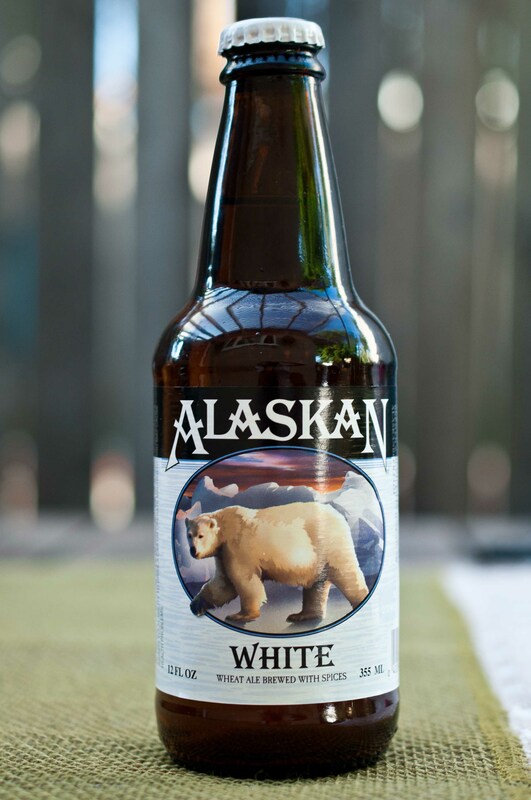 For this recipe I used Alaskan Brewing Company White Ale due to the flavors of citrus, coriander, and a slight sweetness, this beer is a fantastic choice. Choose a beer with similar flavors and low hops, please no IPA’s. In a pot over medium heat, combine the water, beer, cloves, peppercorn and salt. Cook until the salt has dissolved, and the liquid starts steaming, about 5 minutes. Remove from heat and allow to cool, adding a raw chicken to hot brine will start to cook it prematurely. Rinse the raw chicken, removing anything that is in the cavity. Place in a large stock pot, bucket or dutch oven that is just taller than the top of the chicken. Pour the cooled brine over the chicken until submerged. Place in the fridge and allow to soak for 12 hours. If the chicken isn’t fully submerge, turn every 4-6 hours to re-distribute the brine. After 12 hours, remove from brine and rinse thoroughly, pat dry. Place in a roasting rack in a roasting pan and allow to sit, uncovered in the refrigerator until the skin has dried, about 12 to 24 hours. This final step will allow the skin to become crispy during cooking, while the meat is juicy. Squeeze the juice from the lemon over the chicken, place the spent lemons inside the chicken cavity along with 1/2 an onion. Sprinkle the outside of the chicken with pepper. Roast for 1 to 1 1/2 hours or until a thermometer inserted into the thickest part of the thigh reads 160 degrees, or the breast meat is at 180 degrees. If the chicken starts to brown too quickly, tent with aluminum foil. Some people want to be smacked in the mouth with the flavor of beer, while others want the flavors to fly under the radar, yielding a treat they serve to unwitting non-beer lovers. This pancake recipe falls right in the middle. Beer that is tastable, but mild. The difficulty with a scale such as this is that the type of beer you use has a direct result on the “beery-ness” of your final product. While the most important aspect of choosing a beer for your recipes is matching flavor profiles between your beer and the recipe, the second aspect is finding the right level to suit your desired level of beer taste. There are a few tricks you can use to adjust the levels of beer taste to suit your needs. If you want to increase the amount of beer you taste, simply adding more beer may not work due to the fact that you will be increasing the amount of liquid in the recipe by doing so. If the recipe calls for “1 cup of beer” then try putting two cups of beer in a pot on the stove and cooking until it has reduced to 1 cup. This will remove water from the beer and intensify the beer flavors. One thing to keep in mind is that beer is often used as a leavening agent and cooking your beer prior to adding it to a recipe can remove those effects. If you want to decrease the beer taste, substitute some of the beer for a non-beer liquid such as broth, water or juice, depending on the recipe. 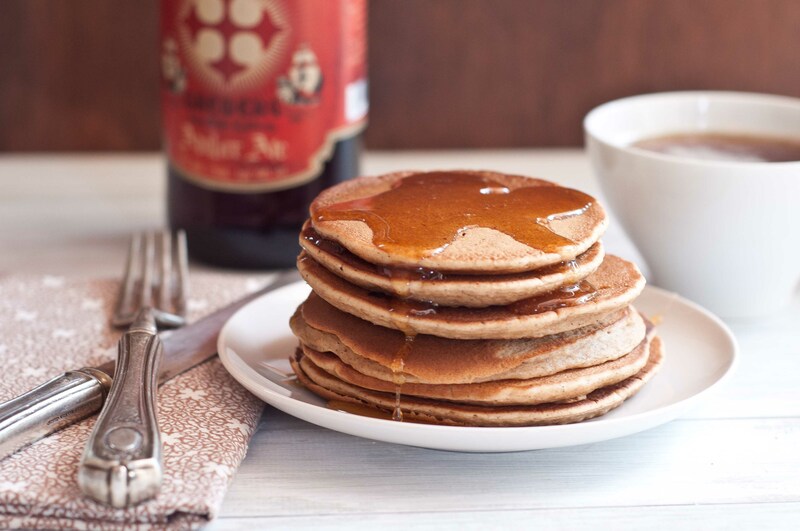 Or, if the beer is being used as a leavening agent (as in this pancake recipe) try to substitute with carbonated soda water. If you want to increase the flavor of beer, look for beers that have a strong “malt forward” or “hop forward” taste notes, but beware of too hoppy beers (Such as IPA’s) because when reduced, they are very bitter. Cooking and baking with craft beer is a journey, there will be a certain level of experimentation, success and failures that you should expect when trying forage ahead in a field that is growing with huge popularity, but with very few who have gone before us. In a lot of ways, this is uncharted water. We should learn from every batch, making note of what works and what doesn’t. Thanks for joining along the road. 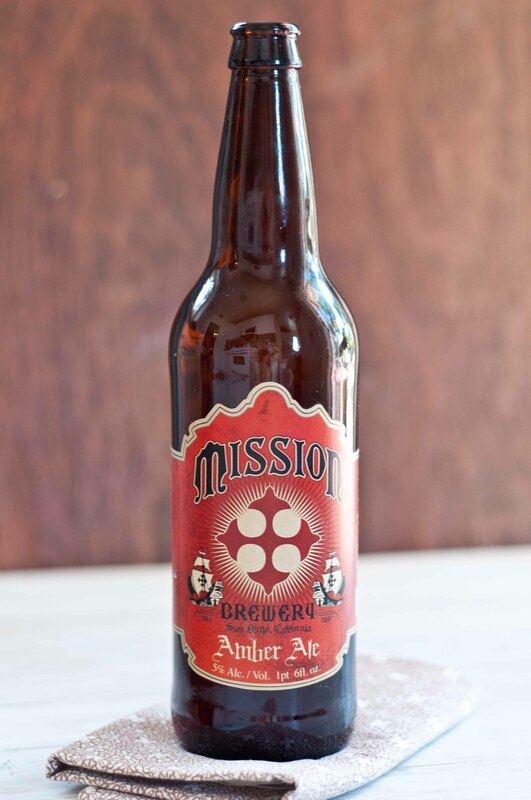 For this recipe, I choose Mission Amber Ale because it has notes of caramel and malt, but with a balanced hop flavor. 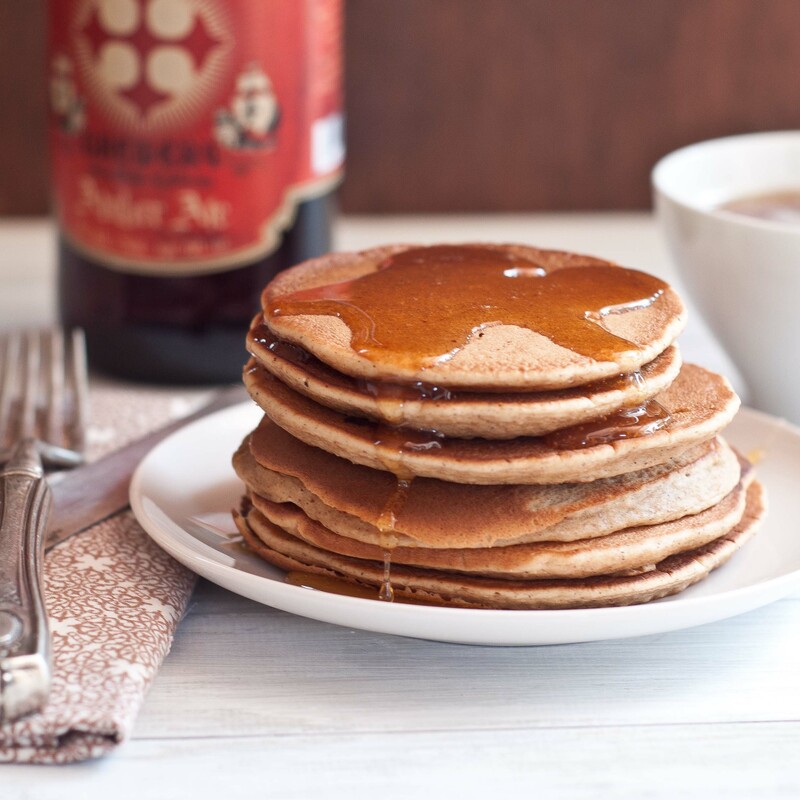 If you want to make this recipe and can’t find Mission Amber Ale, look for an amber with notes of caramel, maple, brown sugar, cloves, or cinnamon with low or balance hop notes. In a bowl add the flour, brown sugar, cinnamon, and baking powder, whisk to combine. In a small bowl, add the egg, the additional yolk, vanilla and the oil whisk until well combined. Make a well in the dry ingredients, add the egg mixture and beer to the center and whisk to combine. Heat a skillet or griddle until hot. Spray with butter flavored cooking spray or brush with melted butter. Pour about 1/4 cup of the batter onto the hot griddle. 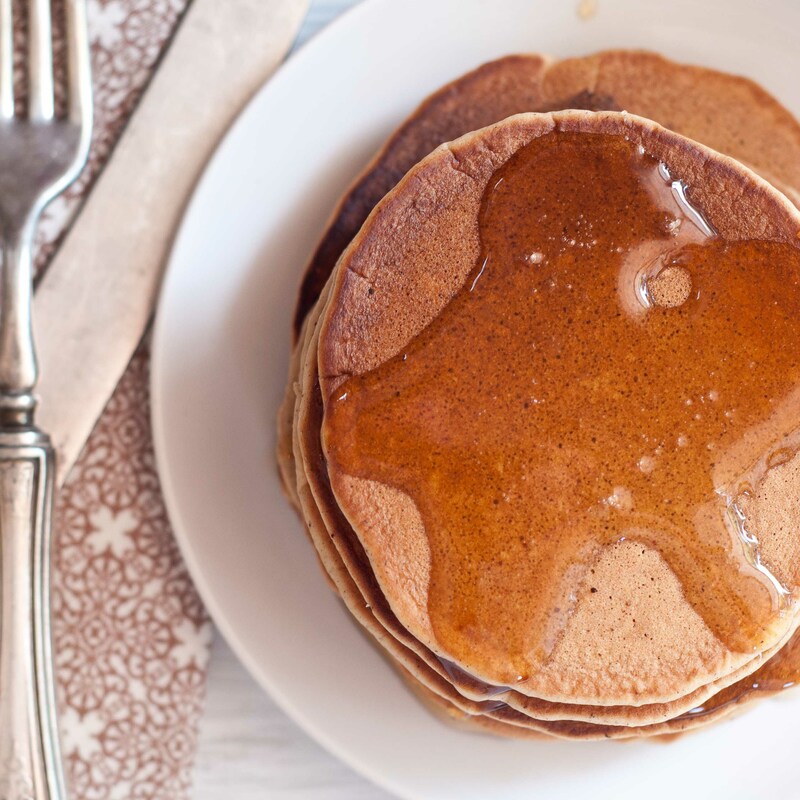 Once bubbles appear in the middle of the pancakes and the edges start to look dry, flip the pancakes and cook on the other side until cooked through, about 5 minutes total (2.5 minutes per side). *For this recipe, plain Grade A Syrup just didn’t seem to be enough for me. I put 3/4 cup of syrup and 1/2 cup of the Amber Ale in a pot on the stove over high heat for about 10 minutes and it thickened and reduced to a caramely syrup that was perfect. I have an analog soul, still shooting with a film camera. I like to read real life paper books. I write letters with pen and paper. I like to listen to the scratchy sound of Robert Plants voice spun out of a vinyl record. I guess I was born too late to enjoy all the good stuff. And little by little my antiquated habits are being digitized. I own a DSLR, an iPod, an iPhone and of course, a MacBook. But I will always shoot with my medium format Yashica, and I will hold out strong with my paper words inside real life pages, and I will always say Thank You with ink and a stamp. It’s probably my primitive spirit that draws me to beers that have been around a while, staying true to what they have always been. Full Sail Amber Ale has been a pioneer in the Craft Beer world since the 1980’s, earning the distinction of the first craft beer bottled in Oregon. And just as you should all have a fierce respect for film cameras, vinyl records and paper books, you should also put Craft Beer Pioneers among those ranks. In a sauce pan, heat the olive oil over medium-high heat until hot but not smoking. Add the jalapenos and Serrano, cook until soften, stirring frequently, about 5 minutes. Add the garlic and cook for about 30 seconds, add the beer and then the remaining ingredients. Allow to simmer for about 8 minutes, stirring occasionally. Remove from heat and allow to cool. Add the blender or food processor and puree until smooth. Store in an air tight container in the fridge. Firefighters are a rare beast. The perfect combination of rugged bravery and compassion driven sensitivity. A sports watching, beer drinking guys-guy, who is also the first in line to pull a shivering puppy from a frozen river and then make a batch of tender homemade scones. So what do you do if you find yourself on the daylight side of a fantastic evening, eye to eye with one these hungry beasts? 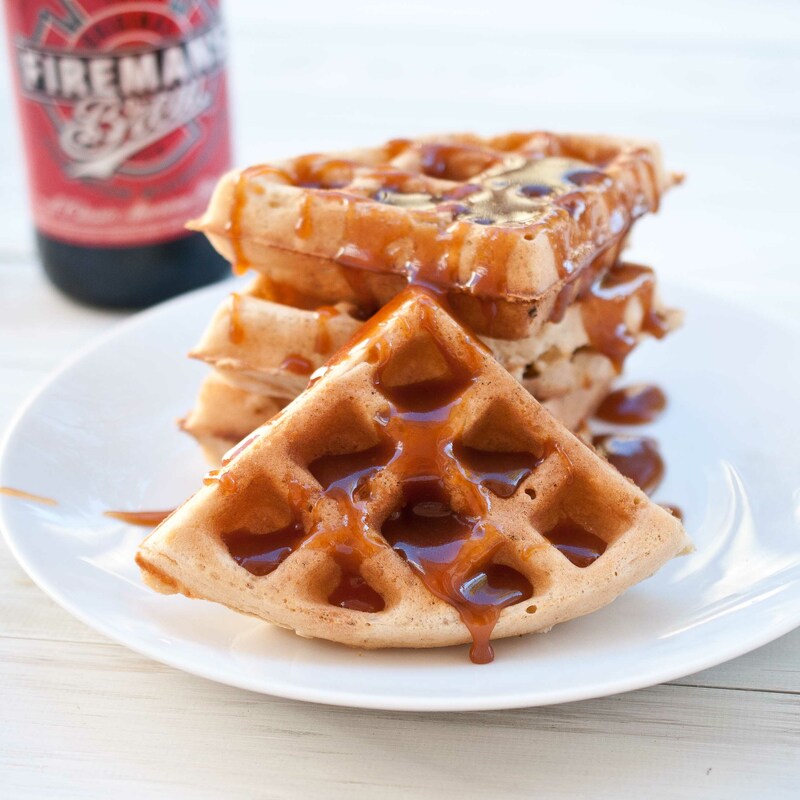 Not just any waffles, beer waffles. With beer caramel sauce. Somehow, it seems to be a rule that every fire house has at least two resident fire fighting chefs, ready for a culinary battle at all times. Making it a near certainty that the beast you woke up with is used to eating, or cooking, great food on a regular basis. Your average breakfast just won’t do. 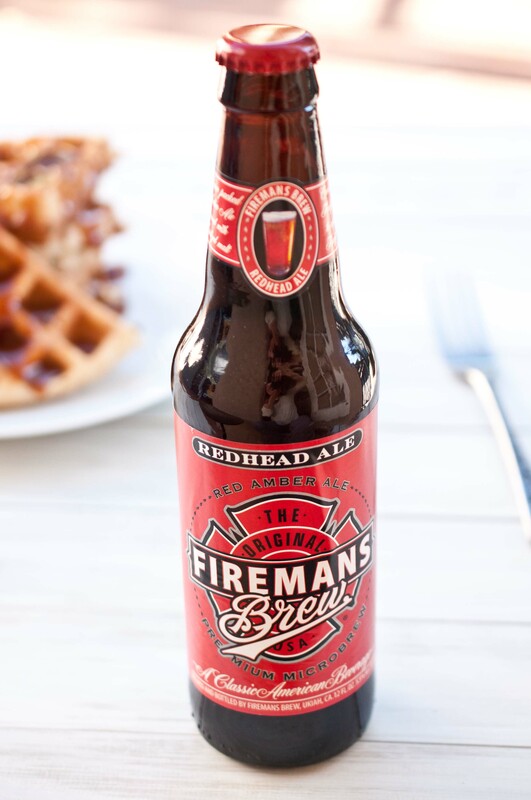 And keep a healthy stock of Fireman’s Brew handy. Not only is it made by real life Firefighters, they even donate a portion of their profits to causes that support families of fallen Firefighters. Craft beer with a cause. Great beer and a warm fuzzy feeling. Fireman sold separately. Make the caramel sauce: Add the beer to a pot over high heat and bring to a strong boil, reducing the beer to about 1 cup, about 6-10 minutes. Remove from heat and add the brown sugar, stir until dissolved. Add a thermometer with a clip to the side of you pan, submerging the tip in the liquid, but making sure it does not hit the bottom of the pan. Boil, without stirring (swirl the pan occasionally to redistribute the caramel sauce), until the temperature reaches between 230 degrees. Remove from heat and stir until the bubbling subsides. Add the cream, vanilla and butter, stir to combine. Allow to cool. Heat your waffle iron according to manufacture directions. In a large bowl, combine the flour, 1/4 cup sugar, salt and baking powder. In another bowl, stir together the butter, milk and egg yolks, in a third bowl add the egg whites and a pinch of salt. Make a well in the dry ingredients and add the milk mixture. Stir to combine. Add the Pilsner (there will be significant bubbling) stir until just combined, a few lumps are to be expected. Whip the egg whites until light and fluffy and tripled in volume. Add the remaining 2 tablespoons sugar, whip until well combined. Stir the egg whites into the waffle batter. Using the waffle iron, cook waffles according to manufacture directions (make sure to use butter flavored cooking spray, if called for). 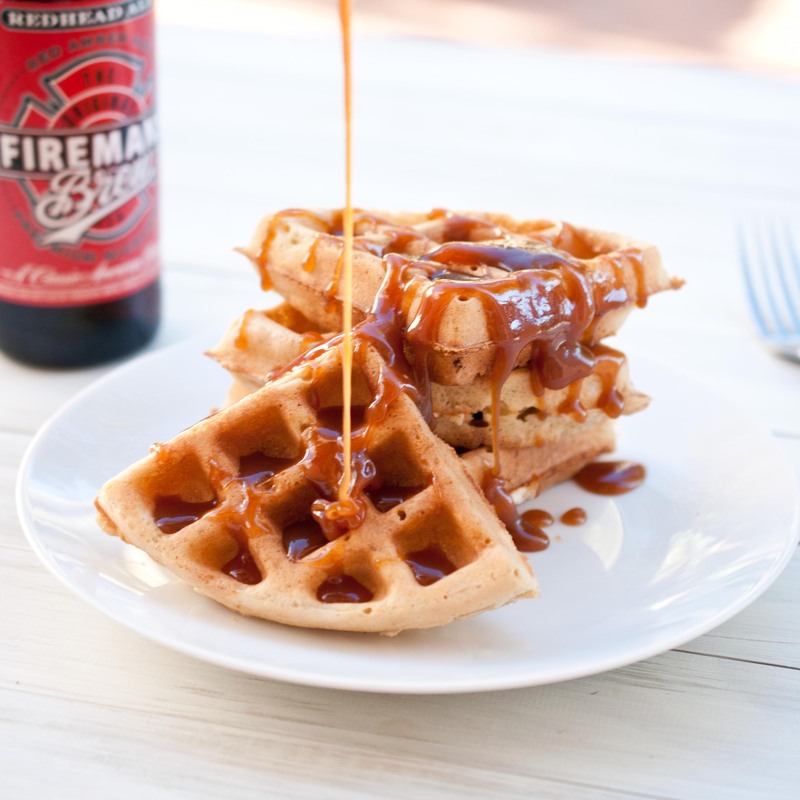 Serve waffles topped with caramel sauce. There are two ways to look at this post. Either it’s a week late, or 11 1/2 months early. I prefer the latter. Unless you are a turkey on Christmas type of person, in that case, I’m right on time. I use Rogue Hazelnut Brown Nectar for several reasons. This is a beer with the perfect flavor profile to brine a turkey, and it is also a beer that is becoming available at more and more locations worldwide. Making it the perfect beer to recommend for this recipe. If you live in a land where Rogue isn’t available, look for another malty brown ale that isn’t too hoppy instead. Why brine with beer? This beer brine does two things: First, alcohol is a natural meat tenderizer. Second, the brown ale gives a beautiful but faint flavor of the hazelnut and malt that Rogue took so much time crafting. Turkey cooking is tricky, while the dark meat should be cooked to 175°, the white meat is done at 165°. 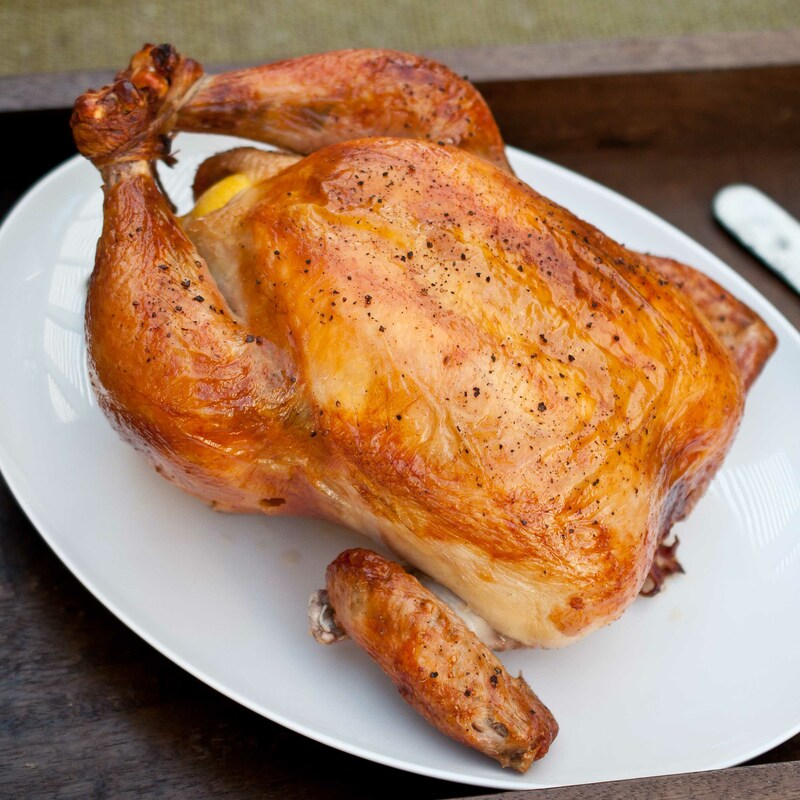 Giving you only two basic options when cooking the whole bird: overcook the white meat, or undercook the dark meat. The beer brine infuses the meat, making it possible to get that dark meat up to the temperature it needs to be without drying the white meat out. This gives you the coveted juicy bird. But what about the skin? Brine can make it soggy. Follow the steps to dry the skin in a roasting rack in the fridge and you’ll have that crispy skin. Crispy skin: check. Juicy bird: check. You might even have some beer left over to celebrate your turkey win. How To Truss A Turkey, Alton Brown. 2 large turkey oven bags, or bucket large enough to fit the turkey, but small enough so that the entire turkey is submerged. Allow to cool to room temp, refrigerating if necessary.The brine must be cooled before you add your turkey or it will start to cook. Rinse the thawed turkey and remove anything that has been place inside the cavity. Place turkey in either the large bucket, or the oven bags. If you are using the oven bags, place one inside the other and the turkey inside those. Pour the brine over the turkey. If using the oven bags, make sure to remove as much air as possible and seal as tightly as you can, placing in a roasting pan in case the brine starts to leak. Place in the refrigerator. Brine for 16-18 hours. If using the oven bags, rotate the turkey every 6-8 hours to insure an even brine. Remove the turkey from the brine and rinse really well, inside and out with cold water. Place turkey on a roasting rack inside a roasting pan. Place in the fridge, uncovered, for 12-18 hours to dry the skin. This is the step that will give you a nice crispy skin to go along with your juicy bird. Truss your turkey if desired. Brush your entire turkey with olive oil, sprinkle with salt. Stuff the other quartered onion, and the celery inside the cavity of the bird. 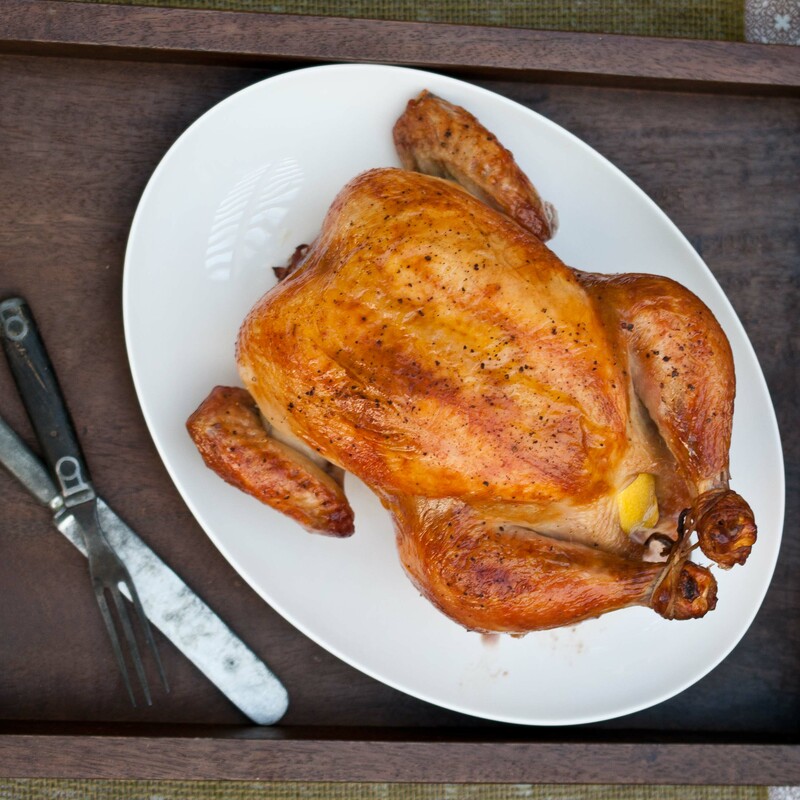 Place the turkey on a roasting rack inside a roasting pan. Add the broth to the bottom of the roasting pan. If the pan starts to dry out during the cooking, add the additional water to the bottom of the roasting pan. Do not allow the broth/water in the roasting pan to touch the turkey. Cook until your turkey reachs about 160 degrees (it will continue to cook once out of the oven to meet the 165 degree temperature). Allow to rest for 10 minutes before carving. Turkey that has been pre-treated or pre-brined will be too salty. Large commercial poultry farms often add a salt brine to increase the weight and therefore the cost of the bird, "Kosher" turkeys are generally pre treated with salt and aren't the best to use with a brine, as they will be too salty. "Natural" turkeys will most likely not be pre-treated with salt. If the label list "sodium" as an ingredient, it will likely be too salty to use with a brine. Look for a natural turkey or one that has never been exposed to salt. I could get really cheesy about this. I could even call it CranBEERy sauce. But I’m not going to do that, because, that would be lame. And I respect you too much for obvious puns. 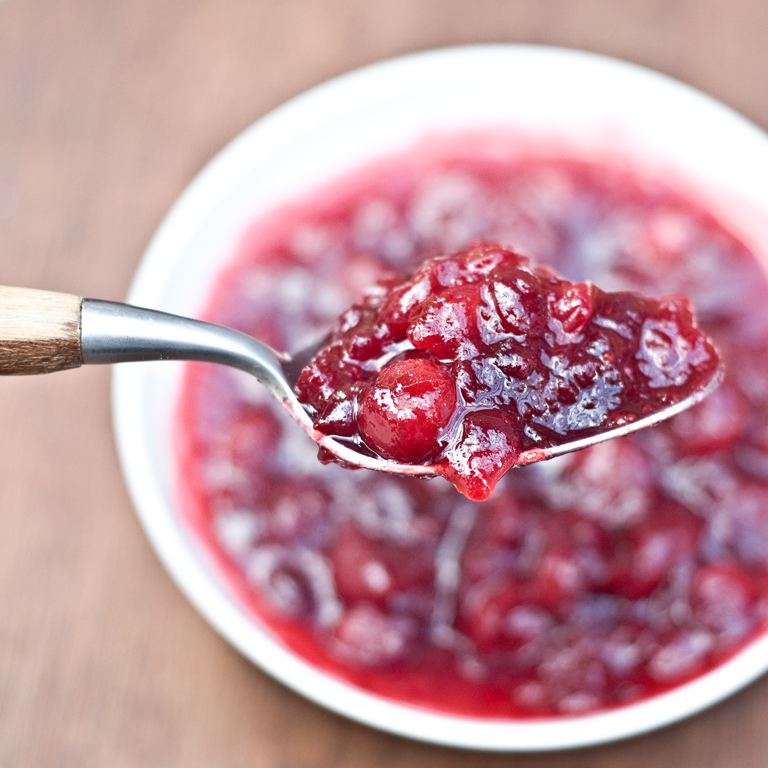 Drunken cranberry sauce? Boozy? All of those overused descriptors miss the point, and the fact that high heat burns off alcohol. A light ale, with a strong citrus note, like Buffalo Bill’s Orange Blossom Ale, lends a beautiful balance to the strong acid of cranberries that you usually see sitting around your Thanksgiving table. I won’t even speak to those of you whose only preparation for anything Cranberry related is the use of a can opener to dispense a hideously ridged gelatinous mass of phallic shaped berry-adjacent matter onto a crystal serving dish. Other things we won’t be speaking of today: the sound that thing makes when it comes out of said can. Clear your head of all thoughts tin related and focus on a sweet and tart taste of a cranberry sauce with back notes of an American Pale Ale. You’ll thank me for the reprieve. Put it all in a sauce pan and allow to simmer over medium low heat until thickened, about 15 minutes. The longer you cook, the thicker it becomes. I came across Albion Amber Ale, from Marin Brewing Co this week. It isn’t a traditional Amber, but the flavors are bright and complex. One taste of this brown ale, and a caramel sauce immediately came to mind. 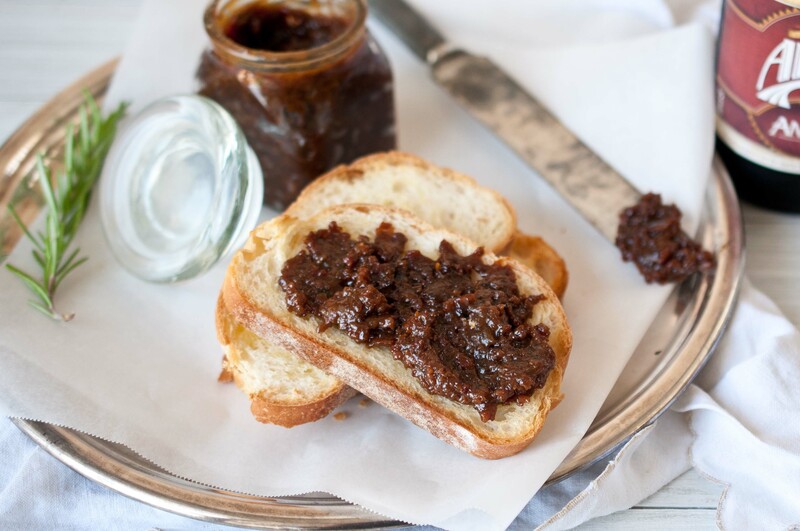 The rich toffee and nut flavors paired beautifully with this recipe and the strong caramel and malt flavors came through in the sauce in such an amazing way. 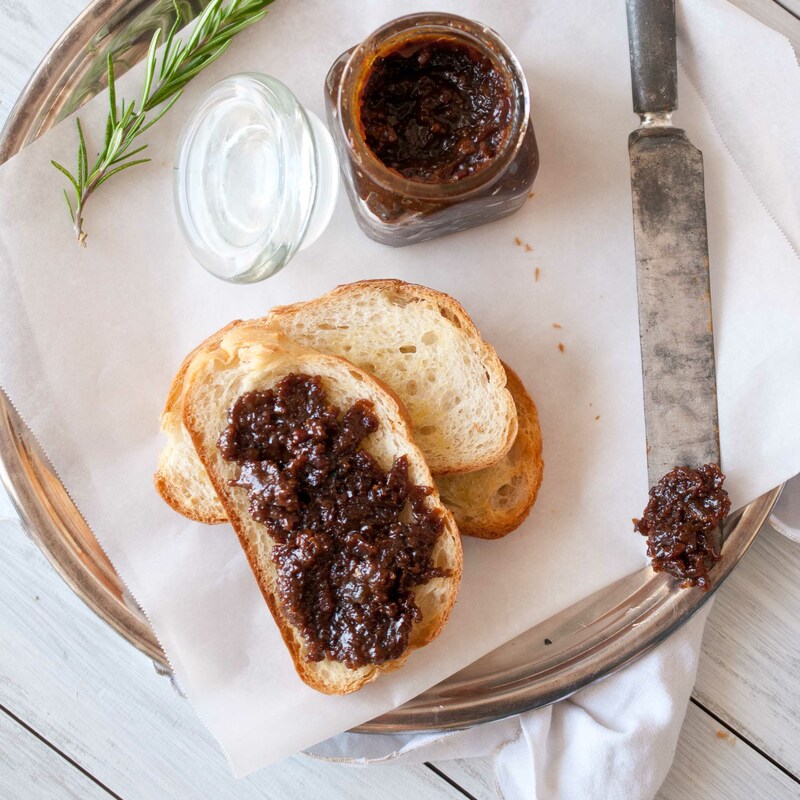 Even if you skip the apple, this sauce is so incredible you can eat it right out of the jar with your fingers. Peel all four apples with a vegetable peeler. With an apple corer remove the core of the apples. Place in a large sauce pan or pot, cover with the beer. Add enough water so that the apples are no longer touching the bottom of the pot. Bring the liquid to a boil, then reduce heat to maintain a strong simmer. Roll the apples with a fork frequently to insure that all side of the apples are evenly cooked. Poach for 20 minutes or until the apples are fork tender. Use a slotted spoon to remove the apples. Raise the heat to a strong boil and reduce the liquid to 1 cup. Depending on how much water you added, this should take about 20-30 minutes. Remove from heat and add the brown sugar, stir until dissolved. Add a thermometer with a clip to the side of you pan, submerging the tip in the liquid, but making sure it does not hit the bottom of the pan. Boil, without stirring, until the temperature reaches between 225-230 degrees. Remove from heat and stir until the bubbling subsides. Add the cream and butter, stir to combine. Allow to cool. 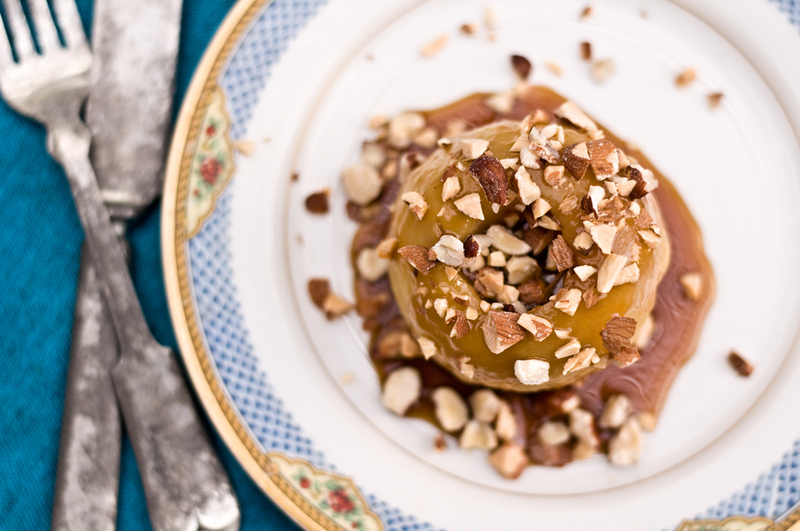 Top the apples with the caramel and the chopped nuts. 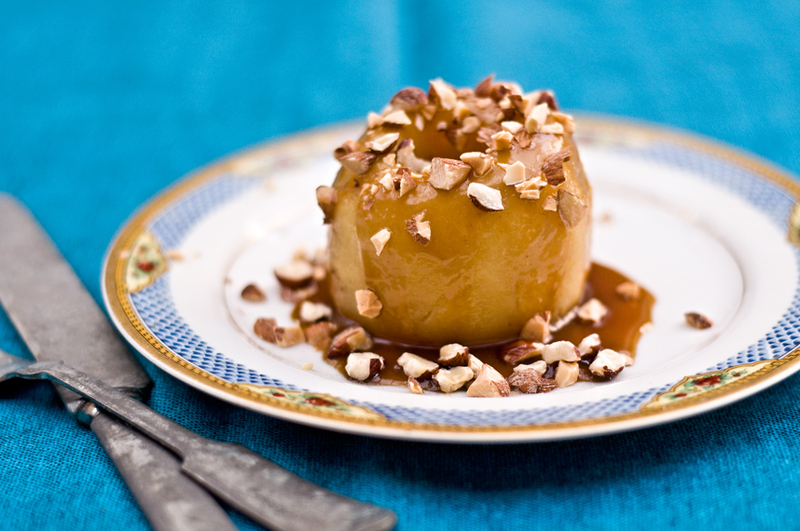 Another fabulous way to serve this is to chop the apples, and serve the apples, nuts and caramel over vanilla ice cream. Amazing. 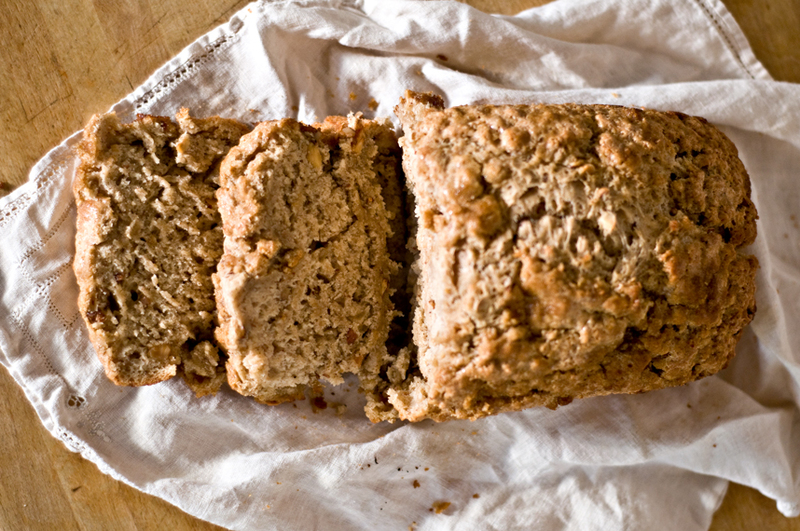 Beer bread is simple. A few ingredients creates a soft, but dense bread. The basic principle is to use the beer as the yeast. Although beer is great in this capacity, adding a leavening agent like baking soda, or self rising flour, is important to help keep the bread from becoming too dense. The simple ingredients open the possibility to so many different types of flavorings. 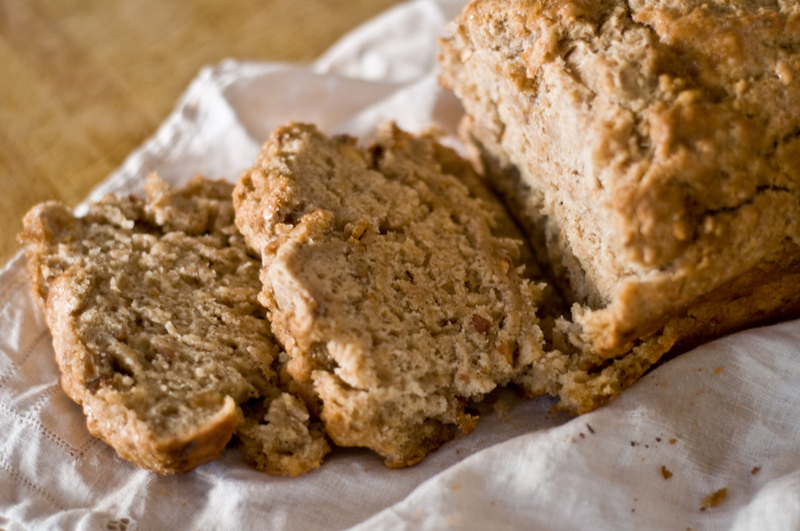 Beer bread can be sweet or savory. I got my hands on a few bottles of the Gingerbread Ale from Bison Brewery for this batch of beer bread. 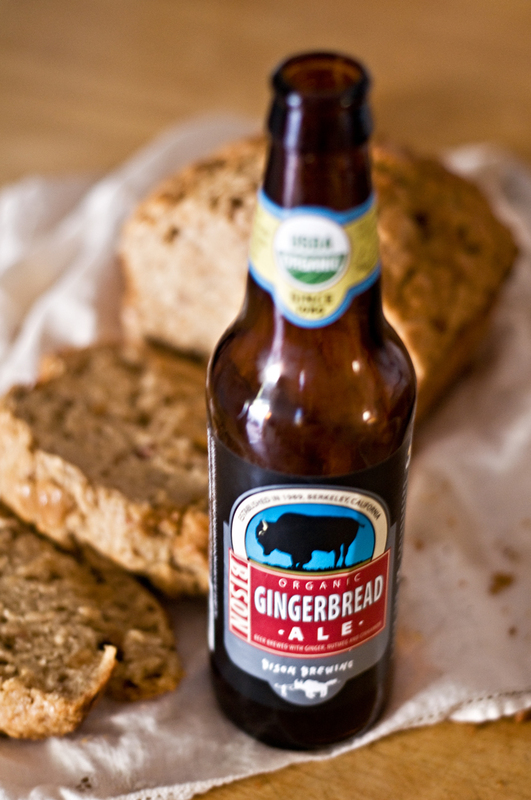 The gingerbread flavors worked so well with the recipe, leaving a mild but distinct flavors of ginger and beer. Preheat oven to 375. Spray a large loaf pan with butter flavored cooking spray. In a large bowl, combine the flour, 2/3 cup brown sugar, baking powder, cinnamon, nutmeg, ginger and pecans. Stir until well combined. Add the beer all at once. It will foam up. Stir quickly to combine. Don’t worry about lumps, thats normal. Add to your batter greased loaf pan. Pour the melted butter on top of your loaf and sprinkle with the brown sugar. Bake for 40 minutes or until the butter has completely absorbed into your loaf and a wooden skewer inserted into the center of your loaf comes out clean. There is nothing new about braising with beer. In fact, it should be the standard. 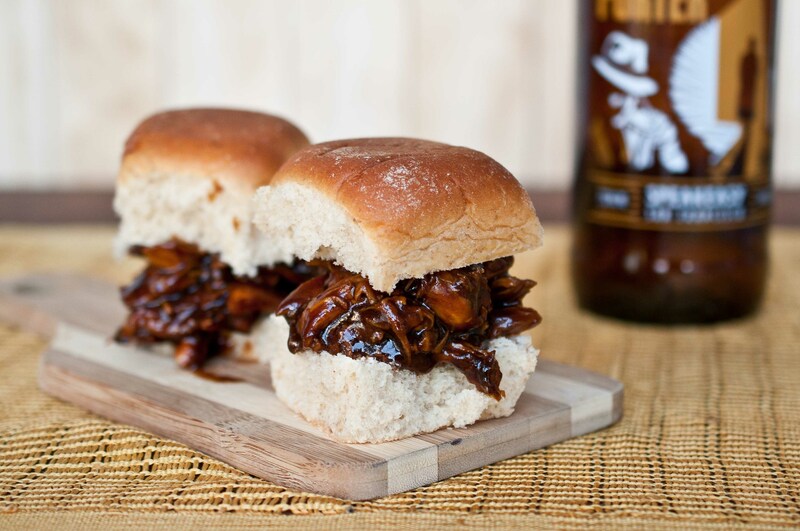 Beer, as with all alcohol, is a natural meat tenderizer but it’s the flavors of the beer that make for braise meat that has a truly special taste. Craft brews are known for more intense flavor profiles and will always produce a vastly superior product when cooking than a macro brew. Craft beer is truly that, a craft. I have had a soft spot for Rogue brewery for years. Rogue is beer lovers beer, and dedicated to the art of the craft. Actual real life people making really good beer. If you live on the West Coast, this Portland Oregon brewery’s beer is probably at your local grocery store. It’s one of the few great craft beers that I have a very easy time getting my hands on. In a small bowl stir together the salt, brown sugar onion powder, chili powder, cumin, pepper, smoked paprika and mustard powder together until combined, set aside. Take out your pork and stab 6, 2 inch deep holes fairly evenly spaced through the meat. Push a clove of garlic into each hole until no longer visible. Rub the entire surface of the meat with the spice mixture, using it all. In a large Dutch oven, heat the olive oil until very hot. Sear all surfaces of the meat, even the sides, until browned. The entire process will probably take about 10-15 minutes.Pour the beer over the meat, cover and reduce heat to medium-low. Cook for about 2 1/2 to 3 hours, turning the meat over about every 30 minutes, until the meat is tender and falling apart. Once the meat is finished, remove from the pot and allow to cool. Use two forks to shred into pieces. Return to the braising liquid and allow to simmer for about 5 minutes. Remove the meat from the pot and discard the liquid. Seriously, you could go all Bubba Gump about this and it would be endless. There is no shortage of uses for Pulled Pork.